Royce Creasey opens a new perspective on two wheeler dynamics | electricmotorcycles.news | It's time. 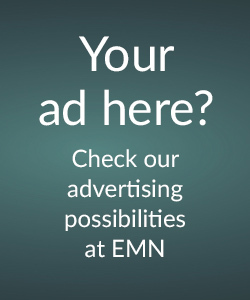 Electric Motorcycles News (EMN) was contacted by Royce Creasey, the leading English FF (Feet First) prototype engineer, with his vision on electric power and two wheeler dynamics. “Don’t think electric motorcycles” he said but “think electric powered two wheelers” and access a future that can make a difference to energy use and congestion …” At EMN we are open-minded and all information is welcome to have a good discussion about the electric future. There’s a problem facing the new world of electric motorcycles and it’s this: Not enough people use two wheelers for them to matter. Two wheelers may be the most efficient form of transport, taking less energy to use and make than any other option. They may offer a solution to urban congestion but unless they can break out of the tiny market niche they currently occupy, it doesn’t matter. Electric power won’t change this, Electric motorcycles just mean more cost, more weight and less range. OK, acceleration can be huge but existing petrol-powered bikes already accelerate massively. It’s time to consider whether the motorised bicycle actually has an electric future. E-power does have a future, but for two wheelers to be part of that the reasons for mass market failure have to be addressed. Market research among ex-motorcyclists gives clear answers. It’s the pain. Motorcycles are painfully cold and uncomfortable and that’s before you even crash one. The general public rightfully recognises that they’re dangerous, statistics for unaccompanied accidents – no other vehicle involved – show that they’re the most dangerous powered vehicle in public use, by a large margin. Add other traffic and it’s even worse. Motorcyclists are nicknamed (Organ) ‘Donors’ by medics and regarded as crazy by the public. Of course they’re also enormous fun, rewarding and stimulating to ride, “closer to flying” in the words of an old friend. This is why I’ve been riding two wheelers with a full licence since 1961. The advantages in traffic penetration and parking are part of the attraction. Thing is, although I regularly use a two wheeler, I’ve hardly touched a motorcycle since 1984, when I sold my Velocette Venom. This is because I’ve got something better. This ‘something better’ has been hinted at throughout the history of motorcycling. The 1912 Wilkinson, the ‘Neracar’ of the late 1920’s, A.V. Roes 1938 ‘Monocar’. After World War two, a host of similar vehicles, like the Italian “Automoto Futura” and most famously, NSU’s record breaking ‘Hammocks’, taking multiple Land Speed records at Bonneville with tiny engines and superb aerodynamics. 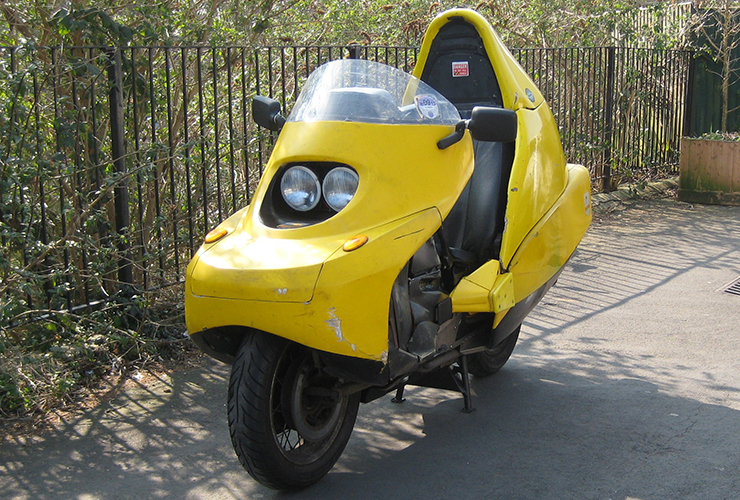 In the last quarter of the twentieth century the process accelerated with Englishman Malcolm Newell’s “Quasar”, Arnold Wagner’s “Ecomobiles” and “Monotracers” from Switzerland and my own “Voyagers” All typical, low-volume and small-scale, entirely separate from major manufacturers who meanwhile continue to focus on their traditional “Motorised bicycles”. Why do these few, esoteric, vehicles matter? The Quasar, huge, heavy and underpowered, demonstrated performance on open roads during Isle of Man TT weeks in 1977/8 that could only be matched by the very fastest motorcycles. An electric powered version of Arnold’s Monotracer won the tandem ‘Alternative’ prize in Elon Musks Efficiency X-prize (and 2.5 million dollars) My 1988 ‘utility’ Voyager returns 90 mpg at 70 mph. An E-racer development prototype recently demonstrated a CDa of .21 in the MIRA wind tunnel, less than half the drag of a racing motorcycle. They’re the worlds most energy efficient vehicles. Efficiency is the key to electric power performance – but you’ll already know that. 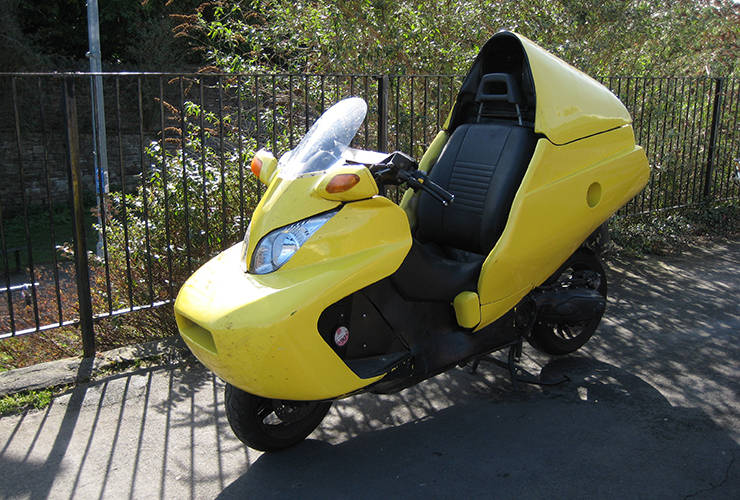 A low Centre of Gravity mainly achieved by lowering the rider, and a secure seating position. There are further details, especially the front suspension, but that’s all it takes to transform the basic dynamics of a two wheeler. There’s a name for these things, also accepted since the seventies and based on the riding position. They’re “Feet First” two wheelers – FFs in common parlance. The development done in the last quarter of the twentieth century was aimed specifically at producing an efficient two wheeler, avoiding the problems of the motorcycle and attracting a mass market, that Would have an effect on energy use and congestion. 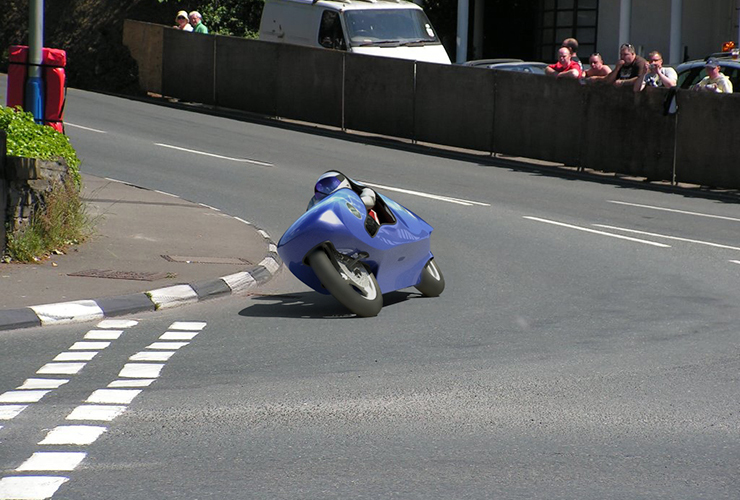 A blatently fake picture of Signpost Corner in the IoM, with a rendering of the E-racer prototype design hacked into it at correct scale to show what an E-racing FF will look like. American E-bike regs would allow this racer, the FIM would need the side bodywork removing. Anyone seeking the vehicle that will best exploit electric power, providing world class range and performance, needs to be aware of Feet First two wheelers. You may be wondering why you’ve never heard of these things, although older motorcycling readers may remember brief media attention in the eighties. It’s the same problem faced by electric power proponents. Traditional motorcycle media isn’t interested in anything beyond the products from the manufacturers whose advertising pays for their magazines, and they aren’t looking beyond their hugely profitable recreational products. Electric power, and FFs, are invisible in MCN or Bike magazine. 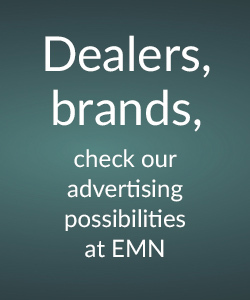 It takes a specialist publication like EMN to break through this wall of indifference, especially when new technical understanding is required – Electric power, or two wheeler dynamics – and there isn’t a lot of advertising revenue around in a new product field. Digital communication is proving key to getting new technologies and products out into the world and EMN isn’t alone in recognising this. Londoner Julian Bond set up the Feet First website in 1997 to provide a home and an address for FF proponents everywhere and it’s the first port of call for anyone interested in the subject. It’s a non-commercial, compilation, website accessible, free, to anyone with an interest. Some treat it as an engineering resource, some as a social club, There are contributions of all sorts, films, photo archives, blogs, technical papers, news and comment. 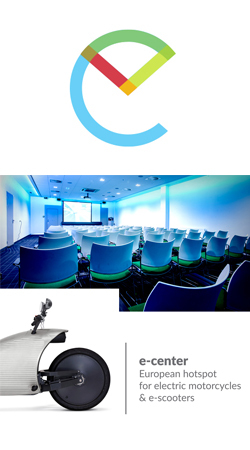 It’s not the most modern piece of web design and it’s grown considerably over the years. But somewhere in there is the answer to pretty much every question ever asked about FFs. www.bikeweb.com is the window on the FF world. Bikeweb isn’t a sales site, although individual vehicles are sometimes offered. 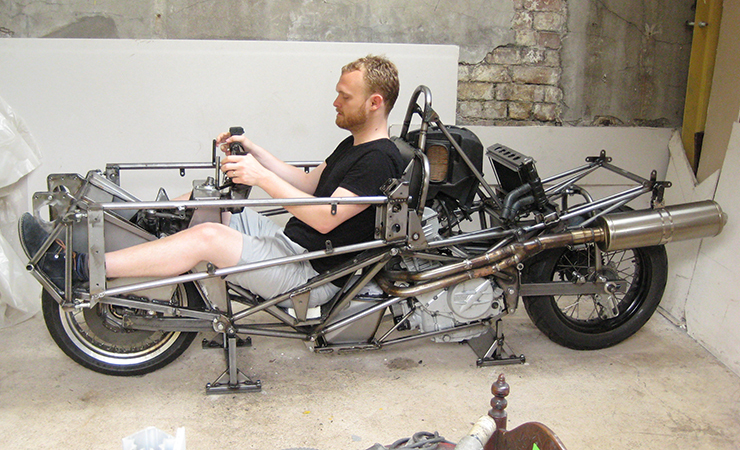 There’s technology on view that’s key to FF design but mostly in prototype form. Plenty of technical detail and demonstrations of performance, not much in the way of moody marketing or indeed sales promotion. It’s a site for engineers, innovators and enthusiasts. Because nearly all the core development of modern FFs was done last century, all the technology on display is in the public domain. There is still development to be done, options on various types to be explored and aerodynamics to be optimised. Anyone interested in designing an FF to exploit electric power can do so by using extinct patents and freely shared design solutions. Any competent vehicle designer or manufacturer could produce better and more refined versions of any of the vehicles seen on bikeweb. Electric powered FFs are generally seen as the obvious next step in this vehicle’s development. What’s needed is connection between the vehicle engineers who’ve developed the FF concept to production quality – but don’t know much about electric power – and the electric power engineers, who don’t know much about vehicle engineering. Together they can present a vehicle with a performance and market appeal well beyond motorcycles, at lower cost than most electric cars. There are a lot of people out there, who routinely need powered transport, that will struggle to afford an E-car. E-FFs can meet that need. Copyright Royce Creasey November 2017. 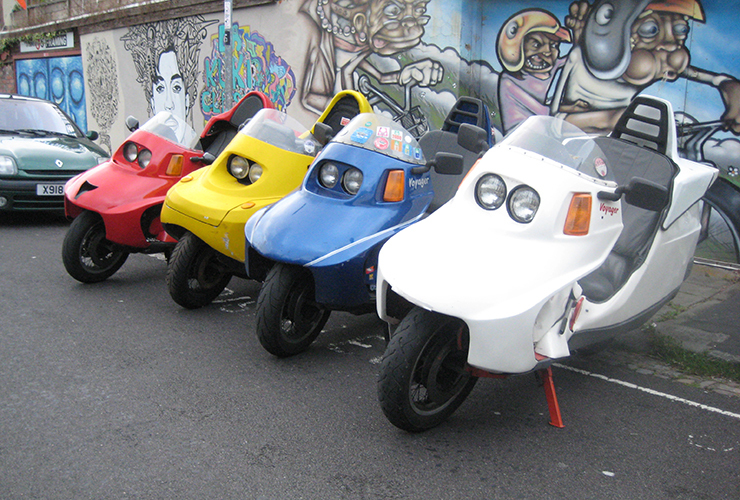 Offered for free publication to Electric Motorcycles News only. Enjoy the site, it’ll cost you nothing, except maybe some preconceptions.